This Chennai attraction holds high significance in being one of the prime locations in India, given the historic moment attached to it. It is on these ground that the prime minister of India, Rajiv Gandhi was assassinated. In here, there are various features, that throw light upon the various happenings on India. From the stone sculpture depicting India's progress at the memorial, an enormous verdant lawn lined trees and a stone inscription with the history of proceedings that happened here. The main draw of this place however, is the exact spot where Rajiv Gandhi was assassinated marked by a stone mural. This mural is highlighted by seven pillars. 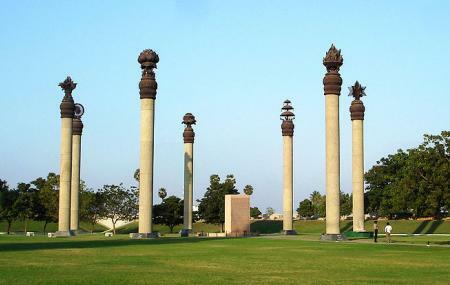 “The path of Light” that traces his final steps is another feature of this Chennai attraction. How popular is Rajeev Gandhi Memorial? People normally club together Sri Maha Prathyangira Devi and Kundrathur Murugan Temple while planning their visit to Rajeev Gandhi Memorial. Awesome place. A big salute to the Martyr and biggest thanks to government for maintaining it. Thanks to all who safe guard it. Truly an inspiration and motivation for the young generation to be loyal to the nation. It was very pleasant to watch the flag hoisting during the sunrise and flag lowering before sunset. This is a daily routine at this place by the army personnel. Please do plan to watch either in the morning or in the evening. Do not miss to watch this event if you plan to visit this place . This place is open from morning till evening on all regular days. Bringing food from outside here is not allowed. Located on the outskirts of Chennai. Best is to visit in early morning or late evening hours, as afternoon is very hot. Late. Prime Minister Mr Rajiv Gandhi was assassinated at same place. In his memory this place was built. Nice atmosphere and well place. No matter which party u follow bu u feel sympathetic. Nice place to hang out our tricolor make u feel patriots. It is very nice place to visit.Good place to come with your kids. And good atmosphere. A beautiful garden to walk around with informative inscribed tablets to read about the achievements,life and death of our beloved prim minister late Rajiv Gandhi.